“It’s ... our most historic action of the year so far,” said Sen. Alison Clarkson (D-Windsor) after the 5-0 committee vote. That all persons are born equally free and independent, and have certain natural, inherent, and unalienable rights, amongst which are the enjoying and defending life and liberty, acquiring, possessing and protecting property, and pursuing and obtaining happiness and safety; therefore no person born in this country, or brought from over sea, ought to be holden by law, to serve any person as a servant, slave or apprentice, after arriving to the age of twenty-one years, unless bound by the person's own consent, after arriving to such age, or bound by law for the payment of debts, damages, fines, costs, or the like. Sen. Brian Collamore (R-Rutland) said Friday that he was initially skeptical of the proposal — and not because he holds a favorable view of slavery. Collamore said the existing language is significant because of its imperfection. “We might have hoped that they did more but they didn’t,” Collamore said of the 1777 drafters. The committee briefly discussed another proposed change to make the constitution more gender-neutral by changing the phrase “free men and free women” to “voters.” Committee members said Friday that they didn’t want to alter that language without a clearer understanding of why those words were chosen in the first place. “If we’re going to make another change, I’d want to be quite certain it’s merited,” said Sen. Chris Bray (D-Addison). The full Senate is expected to vote on the proposed amendment later this month. 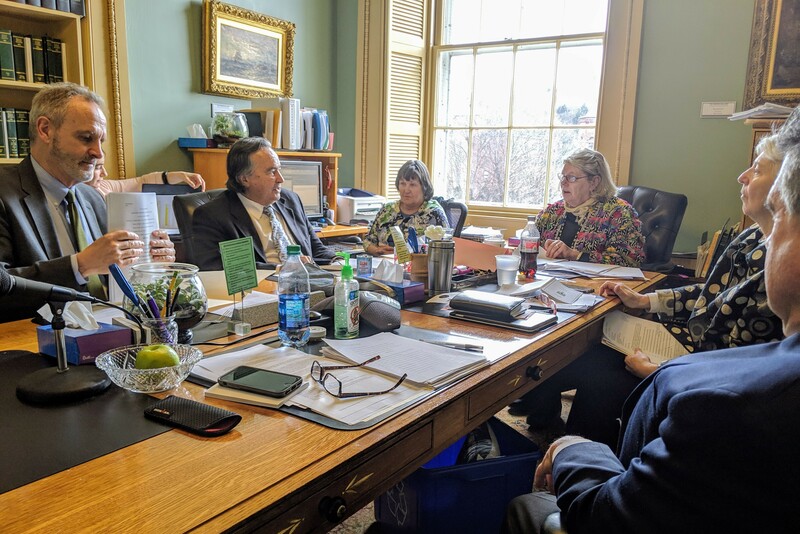 Unlike typical legislation, which requires a simple majority vote, constitutional amendments require approval from 20 of Vermont’s 30 senators. That’s the first major step in a multi-year process that requires the legislature to approve the change in two separate sessions and then puts the question to a statewide vote. If the amendment, known as Proposal 2, were to pass all of those steps, it would become part of the constitution on Election Day in 2022. Correction, April 18, 2019: An earlier version of this post misattributed a statement made by Peter Teachout. Correction, April 15, 2019: An earlier version of this post misstated the possible effective date of the proposed amendment.